Strawberry Crunchy Muesli – I love muesli. Specially with curd and fresh fruits during summers. It’s a mix of rolled oats, corn and wheat flakes, dried strawberry, almonds and raisins. It’s slightly on the sweetish side which works well for me as the curd that I have it with is sometimes sour and I never add sugar or honey to it. There are four more flavours of muesli available – Fruit & Nut, Amaranth, Nutty Delight and Diet. Gaia Oatmeal Cookies – I’m not a very cookie person. I do like to dip one sometimes in my tea though. But this one was a big hit with my son which was very surprising as he doesn’t take to healthy food easily. The cookies aren’t very sweet and two cookies as a snack do a decent job of filling the rumbling tummy. 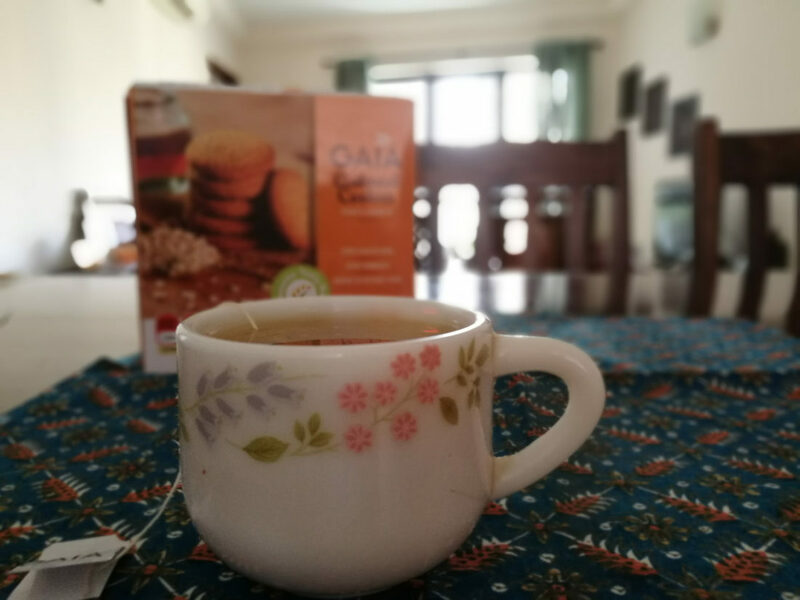 Gaia Green Tea Lemon – I have never been a Green Tea person until recently. In summers, I don’t like to have masala chai as it makes me bloat but I crave for something hot irrespective. For me green tea is an acquired taste. The one I have is a lemon flavour and I’m now having a cup a day for its antioxidants value. Honestly, I’m still getting used to it. 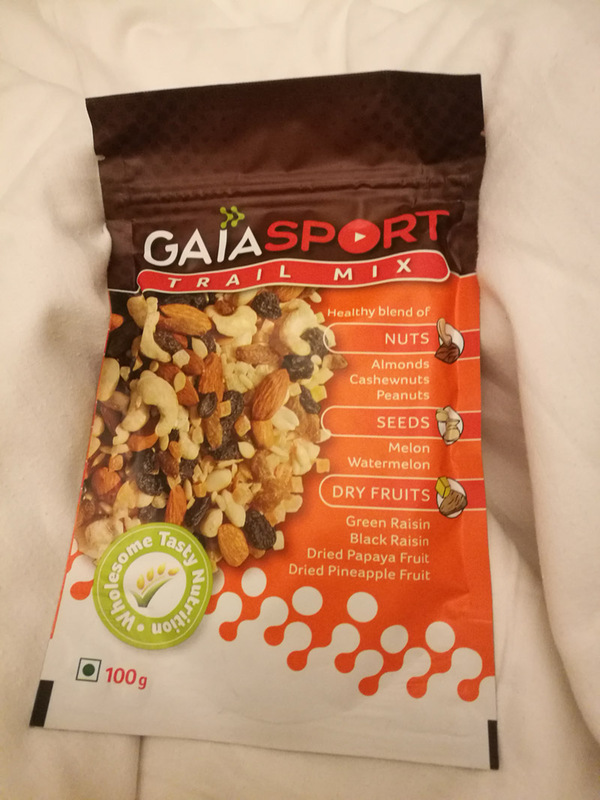 Gaia Sport Trail Mix – My favourite out of all. I carry it with me in my bag and have a portion of it on the go. It’s a blend of almonds, cashews, peanuts, melon seeds, raisins. It’s packed with essential vitamins, minerals, fibre and good fats. For me, it makes for a perfect guilt free snack. The only problem I see here you need to know when to stop as you it’s easy to keep munching on it as it’s very tasty as well. Tip – Finish the pack within a week of opening it for the freshness. 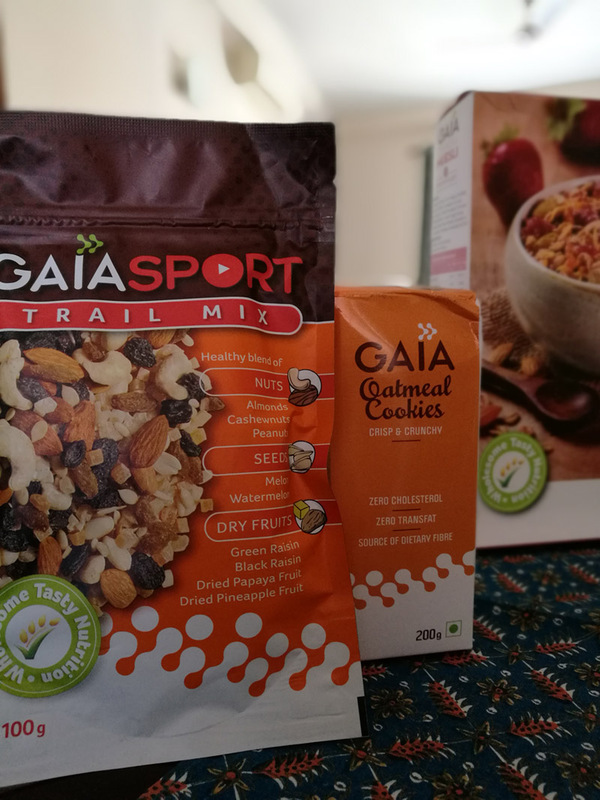 Gaia Granola Bar – Can I be completely honest? I didn’t get to taste this one. I was out of the house when my father who’s a diabetic patient felt his sugar levels were dipping and gobbled the bar for instant energy. He quite liked it. It’s made with muesli, almonds and flavoured with chocolate. All these products are available at leading stores near you or you can order them online at www.gaiagoodhealth.com, Amazon, Big Basket, Grofers and Flipkart. Do let me know in case you have tried or planning to try some of these. Hi thank you for sharing this, i am very health consensus.. its very good for me.